As an anarchist, it’s often frustrating when dealing with contradictions within the law which justify the state. The above quote is the text from the 1st section of the 14th amendment of the United States. When one reads the text (particularly about equal protection of the laws), one senses a great deal of hope for a country that adopts such thoroughly fair policies. The 14th amendment was one of the reconstruction amendments which was passed in an effort to stop the disenfranchisement of the newly freed blacks after the civil war. It was bitterly opposed by the south, and the president Andrew Johnson, but Congress passed it anyway. No anarchist I know of would say this section of the 14th amendment wouldn’t help a country thrive and create trust when it is put into practice. But is it? Literal meanings of laws can often lead to unforeseen consequences, but what negative unforeseen consequences could possibly result from equality under the law? It depends on who you are. The negative consequences from universally applied law is anarchy. If everyone were theoretically given equal treatment and protection under the law, the law would shift until it took a rational direction — namely one that punishes aggression and exalts cooperation and freedom. Anarchy simply means no rulers. In a country where no one is above the law and all must submit to all the laws, that would imply that no one would have unfair treatment from the laws. But this happens everyday. The picture behind him reads “War is when your government tells you who the enemy is… Revolution is when you figure it out for yourself.” Seals completely forgets he is an agent of the state while in uniform telling people who the enemy is. 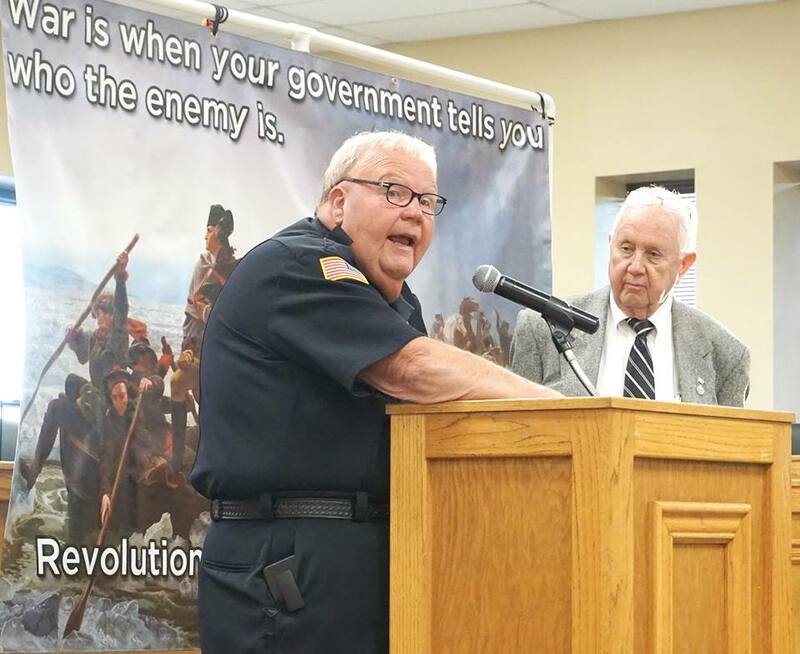 Sevier County Sheriff Ron Seals told the Sevier County Tea Party last week that some of his officers, working in an off-duty capacity as private security, contacted the U.S. Department of Homeland Security after seeing troubling behavior at Tanger Outlet Center in Sevierville. Prompted by an audience member’s statement about women in burqas spending long periods of time in shops without making purchases, the sheriff indicated officers had seen similar behaviors. “We have some officers up there … they’re officers, but they hire them, off-duty police officers, primarily to work traffic, and they’ve noticed the same lady running around up there … taking pictures with a camera,” Seals said. “We got the information. We passed it on to Homeland Security. They’ve addressed it, and I don’t think anything else actually came of it. The discussion was part of a larger talk the sheriff gave about duties of the department and concerns he had for the county. He made his remarks Tuesday at the Sevier County Courthouse. The speech, and questions from the audience, frequently returned to Muslim residents or visitors to the county. Proof that petty tyrants are often sorely lacking in other qualities. When reason fails them, force is the next option to help in implementing their monstrosities. Sometimes it’s no wonder these types are in government or close to government. Willocks told of a Christian church in Dayton, Ohio, that she claimed had been visited by people in burqas acting aggressively toward the congregation. The activity, she said, resulted in an FBI presence at the church. “The FBI came with several cars,” Willocks said. “They went through the security cameras, and one of them was on their most-wanted terrorist list. … The FBI has been at the church every service since. “Obama’s relatives,” someone in the crowd said. Seals said Sevier County churches would be protected. 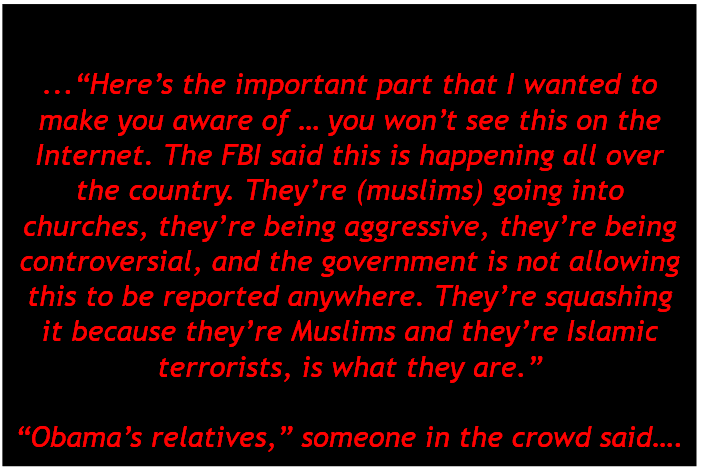 Steve Osborn, former president of the Sevier County Tea Party, asked the sheriff if police monitor local Muslims. “We do know that we have a growing Muslim influence in Gatlinburg,” Osborn said, saying Muslim adherents gather at a location on the Parkway in Gatlinburg. Osborn asked what Seals was doing to monitor the groups. “Are you, in law enforcement, aggressively or actively looking into this group for potential terrorist activities?” Osborn asked. Seals said he would discuss the matter with the FBI and other law enforcement leaders in the community. Equal protection under the law is being blatantly violated in this case for the Muslims in the Knoxville area, and the FBI and DHS are allegedly assisting in it. Allegations of a “takeover” with the ring-leader being the president of the United States himself aside, it comes as no surprise that the sheriff and every law enforcement officer involved — including those from the federal government– are not putting their own laws such as the 14th amendment high on the priority list. Where is the equal protection of the 4th Amendment rights of Muslims who aren’t under any suspicion? Do the FBI, DHS and sheriff Seals mean to imply that actually, no one has 4th amendment rights? This also isn’t an isolated incident from Sheriff Seals either. There is a video here of an incident in which Sheriff Seals assaulted his political opponent (after making allegations about abuse by jailers, but this appears to be a different topic The Conscious Resistance doesn’t have sources on), and at the end of the video the reporter comments that the man assaulted also scheduled a meeting with District Attorney General Jimmy Dunn to discuss the prosecution of Seals but Dunn declined to comment. There is yet another incident of corruption involving Seals. An article was written by local media of corruption charges in which Seals interfered with a DUI arrest made by a deputy within his department. Amazingly, the SAME District Attorney General Jimmy Dunn declined to comment about any investigation against Sheriff Seals. Seals has been sheriff since 2007, and this story has been “developing” since 2009. Most people are rightly baffled at how such obvious corruption can exist at the local level. Most people know of federal level corruption such as the War on Drugs and the bailouts, but rarely do people mention how common and thorough local governmental corruption can be. In 1868, the 14th amendment was bitterly opposed by the Southern states and those who thought equal treatment under the law was a threat to the culture of the United States. Today, while children in public schools are brainwashed within their formative years into believing constitutional rights violantions are rare or don’t exist, we can see many examples at our local governments daily. The problem is that certain people believe they need power or violence to steer the country in the direction they see as most pleasing. When reason fails them force is the only option, and the best way to use force is to use government and create a culture of entrenched corruption. Sometimes the problem isn’t that power corrupts, but that power attracts the worst personalities to it. The only way to attack the root of these problems is to insist on the elimination of the monopoly on force, insist on voluntaryism, insist on a culture that sees people as individuals with choices and responsibility, and insist that people use reason instead of force for change. Even if there were a Muslim takeover happening, it would never amount to anything dangerous if people resisted anyone that violated the non-aggression principal. The “Muslim Takeover” would simply be a series of arguments anyone could ignore. However, everything anyone needs to know about the state’s power and the type of people that love using it most can be see on Seals’ face in the youtube screenshot at the top of the page (it may be important to see the full assault video for full context). Taking on an institution which claims a monopoly of force without resorting to violence requires monumental amounts of energy, collaboration, and mobilization of vast resources. They’re protected by a gang that doesn’t believe in equality under the law and civilians that believe these people should keep all the guns and capacity for force. Until we change this culture, change will be difficult. Rahul grew up in Georgia, USA. He was born in India, in 1990. Rahul currently studies crypto-currencies, Austrian economics, psychology and history.